Interview originally posted on activeAnime. Kalafina is the newest songstress project by renowned composer Yuki Kajiura (.hack:SIGN, Madlax, Xenosaga II & III). Kalafina’s debut album Seventh Heaven was released in the U.S. on May 12th via iTunes and other online music stores. The three members of Kalafina, Wakana, Keiko and Hikaru, were selected by Ms. Kajiura after intensive auditions which featured 30,000 people. The group debuted in January, 2008 with their first single “oblivious” reaching #8 in Japan. Kalafina is featured in the anime film series “The Garden of Sinners” (Kara no Kyokai) theme. Their newest single “Lacrimosa” is the ending theme for the popular anime series “Black Butler” (Kuroshitsuji). 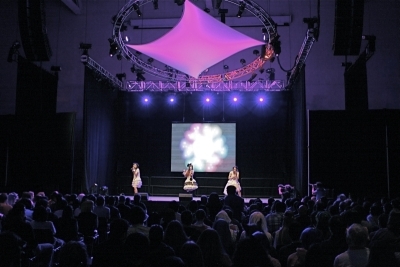 Kalafina held their U.S. concert debut at Anime Boston 2009 on May 23rd. These three lovely ladies gave the Anime Boston crowd a concert to remember. The packed house got to their feet several times during the performance. Kalafina’s three part harmonies and unique style sets them apart from the ordinary. They featured their 3 tops hits, “oblivious”, “ARIA” and “fairytale” as well as their newest single “Lacrimosa”. During the performance, the girls nervously interacted with the audience with their limited English skills which of course just made them more endearing to the crowd. After completing their full set, they took the audience by surprise when they returned to the stage with their producer, the venerable Ms. Kajiura, who took her place behind the keyboard to personally accompany the trio in a final song. Kalafina’s powerful and unique sound made the concert a pleasure and their debut a complete success. After their concert, we were able to sit down with Wakana, Keiko and Hikaru as well as Ms. Yuki Kajiura and ask them some questions. Q: Did you get to see any of Boston while you were here? A: Keiko: We got to see some of the landscapes on the way from the airport and the river, but we have been too busy while here. Hopefully we’ll get to see some tomorrow. Q: Did you do anything to prepare yourselves before performing? A: Keiko: I worked on M.C. part of the concert, especially the English. Wakana: I originally just thought of it as a concert, but when I felt how warm the audience was, I realized I was getting nervous. Hikaru: This was first time performing here, so I was excited and a bit unsure and worried at the same time. Q: Are you happy with the response you have had for your U.S. debut? Q: What should we look for in your next single? A: Please pay attention to our three part harmony. Q: Do you record together for the harmonies? A: No, we record separately. Q: Ms. Kajiura, what are your hopes for Kalafina? Do you want to take them beyond the bounds of just anime? A: I’m not planning Kalafina just for the anime “Garden of Sinners” or just another theme song. Just want to express the Kalafina music style and be accepted for what it is. Q: Ms. Kajiura, when you thought of Kalafina, did you already have singers in mind and did you originally want a trio? A: I didn’t have any idea on the number of members originally. We currently found 3 great singers. Nothing was planned and they all auditioned. Q: How have you found working with each other? A: Keiko: Wakana is good at making me laugh. She has a great character. The same with Hikaru, who is calm and settled. I’m very comfortable with them. Wakana: I usually have to be the one to bring the other 2 back when they are spacing out. On stage, I’m usually in the center directing things. Hikaru: There’s no real “leader” for us, it’s a group thing. Q: Ms. Kajiura, why did you select these three members for Kalafina? A: Their different voice qualities blend and create energy. Q: Ms. Kajiura, you have done a lot of action soundtracks, was it difficult to transition to the darker tones in “Garden of Sinners”? A: Nothing in particular was very difficult for me. We constantly discussed how we wanted it to sound which was to do it in a very neat and delicate sounding way. Q: Ms. Kajiura, what started you down the path to creating anime and game soundtracks? A: I was working for a film and was approached by a producer to do it. Q: Ms. Kajiura, which do you find more difficult to create, soundtracks for anime or games? A: I find them about the same. Both are difficult and interesting to do. Q: Ms. Kajiura, since the only company licensing soundtrack in the U.S. has ceased operations; do you have any plans to release your other works here? A: Honestly, no. 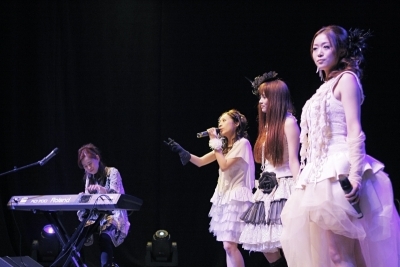 There’s nothing planned, but perhaps someday through a digital release, as we are doing with Kalafina now. Q: Ms. Kajiura, do you have any one project or theme you are most proud of? A: I’m proud of everything I have made. Q: Ms. Kajiura, where do you find your artistic inspiration? A: In books and words. Things without sound. Q: Have you travelled to other countries outside of the U.S. and Japan? A: Hikaru: This is my first time out of Japan. Keiko: I have been to Korea. Wakana: I have been to New Zealand. Kajiura: I lived in Germany, so I have visited a few other European countries. Thanks for taking the time to talk with us today, and have a safe trip home. In conclusion, if you are looking for an interesting sound, soaring ballads and a great pop sound, run to the nearest online music store and purchase Seventh Heaven. I have my copy, why don’t you?